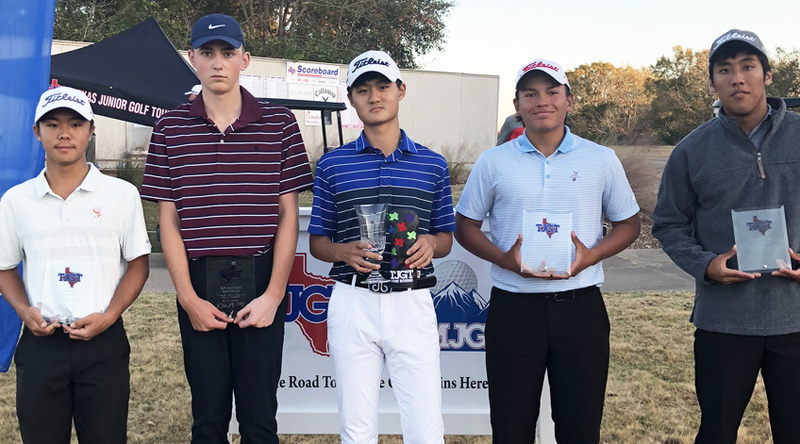 [DEC 1-2 | BRYAN, TX] When strange opportunities present themselves, the best players often seize the moment and take advantage, and when one presented itself during the second round of the Traditions Fall Invitational, Lewisville’s Junwoo Park took full advantage, firing a final-round 2-under-par to vault into the lead and claim the 2018 Traditions Fall Invitational championship by one shot. Part-way through the second round, tournament leader Michael Heidelbaugh suffered an injury and was forced to withdraw, leaving the tournament wide open for the rest of the field. Park, who started the round five shots out of second place, shot a tidy 1-under on his first nine holes of the second round before turning it on down the stretch, making birdies on his 13th and 15th holes to come in at 2-under-par and 2-over for the tournament. Austin’s Jacob Sosa – coming off his victory in San Antonio the week before – started the day just two shots off Heidelbaugh’s lead, but had an up-and-down final round, avoiding any bogeys, but made three double bogeys, offset by three birdies, including one on his 17th hole of the day. After missing his birdie putt on the final hole, Sosa tapped in for par to finish one shot behind Park and in second place. Rounding out the Top 5 was Cypress’ Tomek Pickrell, who finished solo third, and Greg Seo and Samuel Kim (a West Point signee), who finished T4. In the Girls Division, a dramatic finish on the final two holes lead to an exciting playoff. McKinney phenom Avery Zweig sank a testy 10-foot putt for birdie on the 18th hole (after making double-bogey on 17) to get into the clubhouse at +4 for the tournament and atop the leader board after shooting a 1-under 71 in the final round. All she could then do was sit back and watch the final group finish on 18. Katy senior (and Kentucky signee) Kelsey Wylie, who started the day tied for the lead, made a disastrous triple bogey on the difficult par-4 17th hole, and came to the equally difficult 18th needing a birdie to tie Zweig and force a playoff. After a solid drive, Wylie stuff her approach to tap-in range and calmly rolled the birdie in, tying Zweig atop of the leader board. 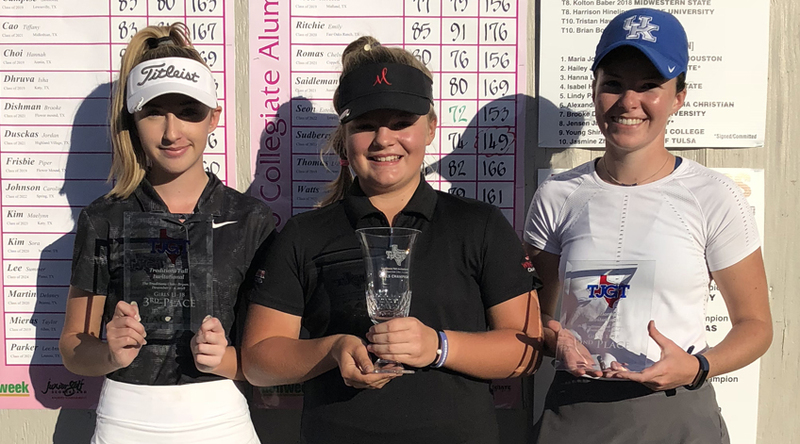 Neither young lady was unfamiliar with playoff golf, as Zweig lost in a playoff the week before in San Antonio, and Wylie had been a part of at least four sudden death playoffs on the TJGT. In the playoff, both Wylie and Zweig hit the fairway, and each hit their approach shots to about 10 feet. Wanting to avenge her playoff loss from the week before, Zweig slammed her birdie putt home, and when Wylie’s putt slid by, Zweig claimed the title. Rounding out the Top 3 in the Girl’s division was The Woodland’s Sky Sudberry, who finished just a single shot behind the leaders. To view the full leader board, click here. To view photos from the event, view our album on the TJGT Flickr Page.